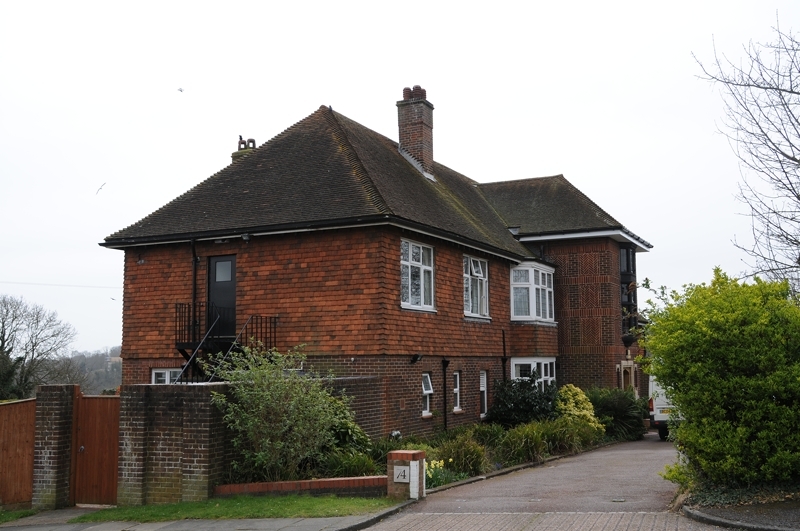 Coppercliff Nursing Home was a beautiful rambling house located at 74 Redhill Drive Withdean. The house was donated to the people of Brighton and Hove, by the Braybon Family (famous local builders at that time). In 1965 it became a hospice for cancer patients. When The Martlets hospice in Hove opened in 1997, Coppercliff was renamed Outlook House and became a residential care home. It had such lovely gardens with a tennis court at the bottom. There was a sweeping central staircase with a lovely stained glass window on the first floor landing. The window had a picture of a builders trowel. I have such sad memories, but at the same time I remember the wonderful nursing staff, led by the then Matron, Olive Burrage. My late father died at Coppercliff in March 1969. After my father died, my late mother, Mary Doogan, was a sister there for a few years. The patients all had their own rooms and enjoyed wonderful food prepared by the cook, Joan Sargent and her team of kitchen staff. I also remember Mrs Joy, who did the flowers and used to bring her lovely scottie dog to work! I was a volunteer helper for a while after my father died. It was an oasis of peace both for the patient and their families and loved ones. I will never forget the kindness shown, or indeed the sacrifice that the Braybon family made, in giving up their family home. My grandmother was there when she got cancer. Her name was Evelyn Emma Kirkham. She died in 1977. They were very helpful to her in her final days. We could not have wished for a better place for her. My Dear Uncle John Taylor (my Mum’s brother) who lived in Holland Street, died there in April 1975. My mum died in Coppercliff in April 1985. I remember that the care she received there was absolutely amazing. Nothing was too much trouble for those patients and they and their families were treated with such dignity, repect and care. I’m afraid I don’t remember any of the nurses names that looked after Mum or who were there before she died, but if any of you remember her I would just like to say thanks for all that you did for her. Her name was Lilian Pelka. It was the amazing care that she got that inspired me to become a staff nurse myself and help others in need too. The McBrien family lived at 70 Redhill Drive from 1964 until my Father’s death in 1993. In his latter years I think he became a bit depressed seeing hearses leaving Coppercliffe. The building really did blend in with the area. Regards Chris. Hi. My later mum worked at Copperclliff for 21 years until she had to retire due to ill health (cancer.) She fought it for over 20 years, until she passed away March 1996. We have photos of the staff mum had – she spoke of so many staff and patients. I know mum always seemed happy to go to work, bless her. She even nursed her sister in there until she passed away in ’82, I think it was. Mum usually worked with Theresa Lelliot, and spoke well of many others but I have forgotten their names (sorry). Coppercliff was a wonderful place where people came to rest and be looked after along with their family members; I love reading about Coppercliff. Hello Liesa, I left a message for you some time ago on the pages about Redhill Drive, that mentioned Coppercliff. My late Mum was Mary Doogan who worked with your Mum and Theresa Lelliott and also Cissy Wallace. To Liesa, I worked at Coppercliff for 6 years in the late 70s and early 80s with your mum and Theresa. I remember her really well and still have photos of us all together. She was a lovely person, always talking about you and your brother Karl. Sunday’s were our favourite day to work. I remember the deputy matron Margaret Webb and her twin daughters who helped with the suppers there. Also many others whose faces I can picture but full names now escape me. It was a not a sad place to work because of the great caring ethos. Great memories. My dear sister Gillian Mendoza spent her final days in Coppercliff hospice, in November 1987. The staff there were marvellous, very attentive to her needs. I now work for Dove House Hospice in Hull. I have just heard recently that Olive Burrage, the first matron as mentioned above, died in April of this year. I will remember her for her care and compassion and dedication. She was a one off. May she rest in peace. Hi Maggie and Tina, it’s so nice to read re my late mum ‘Sheila Gohmann’. Coppercliff was her life! I don’t ever remember hearing mum say ‘I hate going to work.. or call in sick.’ I’m so proud of my dear mum and miss her so much, lost my dad (Chris Gohmann) just 2 years ago, you may know of him Maggie, I believe he worked with your mum, Sister Doogan! And oh my do I remember her! She worked at the maternity department at the RSCH in 1980 when I gave birth to my first child. Dad came to visit me at 9pm on Sunday 9th Nov 80 and my husband Steve had to leave at 9pm but dad could come in after cos your mum was there and she said he could! Noone crossed her and oh my Goodness couldn’t we do with more like Sister Doogan today! I’m going to go upstairs now and find some photos of Coppercliff and staff and patients. My email address is LAMSAUNDERS@HOTMAIL.COM or can be found on facebook if you want to see some pics. Would love to hear from anyone who looked after my mum, before she died, in April 1985… just want to thank them for all that they did for her to make her last weeks as comfy and dignified as possible. The care that those people received at Coppercliff was just amazing, as was the family support they gave too. My mum was a patient who passed away aged 26 in 1980 in Coppercliff. I can remember it was such a beautifull place, the nurses were fantastic. I remember my mum’s room was lovely, a home from home.